Online architecture database Architizer has just announced the winners of its first annual "A+" awards, meant to "break architecture out of the echo chamber" and into the public eye. There were 52 categories in total, ranging from Best Memorial to Best High-Rise Office Building. Buildings could win in one of two ways: 1) Jury Award - chosen by an international panel of over 200 architects, cultural leaders and people who hire architects, or 2) Popular Award - a public vote with people from over 100 countries. The winners are unique designs from every corner of the planet. We're highlighting some of our favorites here; click over to Architizer to see the full collection of winners. Are These the Coolest Buildings in the World? The Daeyang Gallery and House in Seoul, South Korea, Steven Holl Architects. The House In Travessa Do Patrocínio in Lisbon, Portugal, Luís Rebelo de Andrade, Tiago Rebelo de Andrade, and Manuel Cachão Tojal. The Dolomitenblick in Sesto, Italy, Plasma Studio. The Iceberg Dwellings in Aarhus, Denmark, Julien De Smedt Architects, Cebra a/s, Search, and Louis Paillard. The Sliced Porosity Block in Chengdu, China, Steven Holl Architects. Skyhouse, in New York, David Hotson. Centra at Metropark in Iselin, New Jersey, Kohn Pedersen Fox Associates. The Vakko Fashion Center in Istanbul, Turkey, REX. Daum Space.1, Seoul, South Korea, Mass Studies. The iGuzzini Illuminazione Ibérica Headquarters in Barcelona, Spain, Josep Mias Architects. The China Steel Corporation Headquarters in Kaohsiung, Taiwan, Artech Architects. One Shelley Street in Sydney, Australia, Clive Wilkinson Architects. Sugamo Shinkin Bank in Tokyo, Japan, Emmanuelle Moureaux. The CONTemporary Library in Plovdiv, Bulgaria, studio 8 1/2. Cabañas Morerava in Isla de Pascua, Chile, AATA Arquitectos. Wildspitzbahn in Tirol, Austria, Baumschlager Hutter Partners. The Carrasco International Airport in Montevideo, Uruguay, Rafael Vinoly Architects. 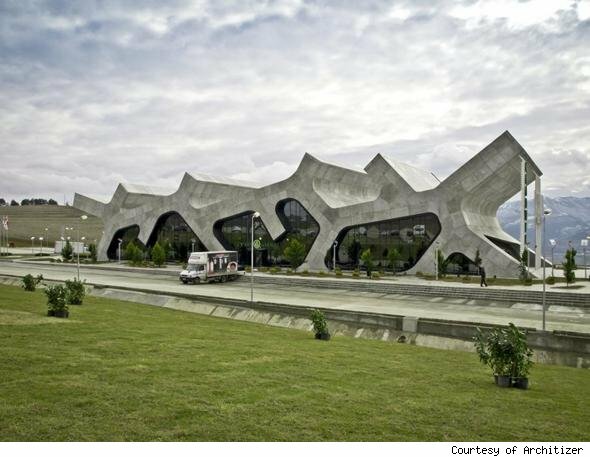 The Rest Stops in Gori, Georgia, J. Mayer H. Architects. The Yardmaster's Building in Melbourne, Australia, McBride Charles Ryan. Bicycle station ICE Bahnhof Erfurt in Erfurt, Germany, Osterwold+Schmidt. Guertin Boatport in Storm Bay, Canada, 5468796 Architecture. Museo Soumaya in Granada, Mexico, Fernando Romero Enterprise. The Dalian International Conference Center in Dalian, China, Coop Himmelb(l)au. DOMUSae, Spaces for Culture in Madrid, Spain, Aparicio and Donaire. The Horse on the Ceiling in Muenster, Germany, Zauberscho(e)n.
This Pool and spa area for a Hotel in Majorca, Spain, Estudio A2arquitectos. The UNO Elementary School Soccer Academy in Chicago, Illinois, JGMA. UBC Faculty of Pharmaceutical Sciences in Vancouver, Canada, Saucier And Perrotte Architectes and Hughes Condon Marler Architects. The National Tourist Route Trollstigen in Trollstigen, Norway, Reiulf Ramstad Architects. The Minnesota Fallen Firefighters Memorial, St. Paul, Minnesota, Leo A. Daly. The Garden Mausoleum at Lakewood Cemetery in Minneapolis, Minnesota, HGA Architects. The Cluj Arena in Cluj- Napoca, Romania, Dico si Tiganas. The New Holmenkollen Ski Jump in Oslo, Norway, Julien De Smedt Architects. Superkilen in Copenhagen, Denmark, Bjarke Ingels Group, Topotek 1, and Superflex. The Armadillo Crèche in Johannesburg, South Africa, Cornell University Sustainable Design.